Posted on April 23rd, by Mat Taylor in General. Comments Off on 2018 So Far! What a start the Werribee Concert Band has had to 2018! 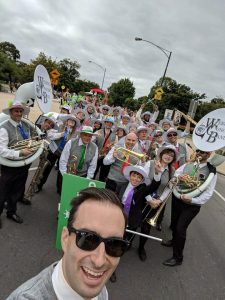 Our first gig of the year was Melbourne’s famous Moomba Parade. We, for the first time, were in the first few performers of the parade – right up the front and for the first time saw some amazing TV coverage. In a parade first, we also marched with 2 Sousaphones (2 SOUSAPHONES!!!!!!) this not only ensured we sounded great, but we looked great too. Moomba is such a fun day for the band. The next gig was our local Werribee street festival, Weerama. It was a raining and blustery Sunday morning, but we made it work. It is great to march down the main street of your home town with your friends and family lining the streets. We are really lucky to live in such a tight knit and supportive community. Looking forward, we have what has become an annual trip to Warracknabeal. In early May we again perform at the Wimmera Bands Sunday event. The band loves traveling to Warracknabeal. We will be teaming up with the Warracknabeal and District Band led by the amazing Jason Wright (an ex-member of ours) and supported by his wife Maxine (another an ex-member of ours) play lots of music, and most importantly have a heap of fun (1 or 2 beers may be consumed too). Then we are performing in the Cranbourne Lions Concert Band’s Concert Band Festival (it’s a mouthful!) This day is organised by the wonderful people at the Cranbourne Lions Concert Band. The day will feature 13 concert bands with the aim of getting together, playing music and having fun. The band is preparing a challenging program of Amparito Roca, Soul Bossa Nova, Sophisticated Ladies, In Heaven’s Air and First Suite in Eb (Mvt 1). In writing this, I’ve quickly realised how much of my life is spent with people from band. Every Thursday night, heaps of gigs through the year, committee meetings and fundraising events. On top of this, I often spend time with these people to do non-band stuff. I am so lucky to lead a group of fun, enthusiastic, dedicated friends who come together not only because they love music, but because they love spending time together…. Lucky man right here! The Training Band’s First Major Concert!